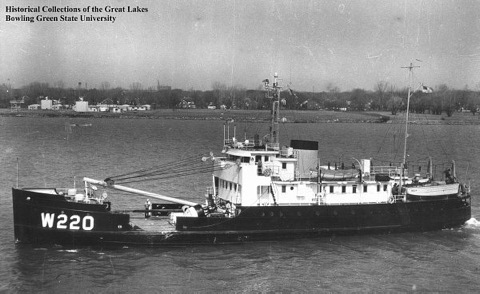 In the 20th century, numerous ships called ‘lakers’ carried bulk cargo to the sixty-three commercial ports along the Great Lakes. Not only did these ships keep industrial centers supplied with iron ore, limestone, coal and grain, many of them were tragically lost to the lake. The most famous of these vessels is the SS Edmund Fitzgerald, which went down in 1975 in Lake Superior. Yet seventeen years earlier, the freighter SS Carl D. Bradley also sank in a November storm with an even greater loss of life. 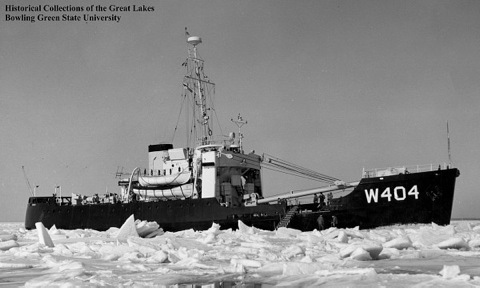 Because of its size, each year the Bradley served as an icebreaker through the Straits of Mackinac all the way to Indiana. 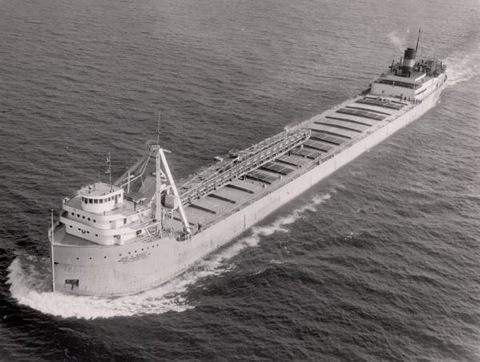 The vessel’s main function however was to carry limestone to Lake Michigan’s deepwater ports from Lake Huron and Lake Superior. In 1957, the Bradley collided with the MV White Rose on the St. Clair River and underwent repairs to its hull. The following year, it ran aground twice, but never reported these incidents. The U.S. Coast Guard later speculated that the collision and groundings may have led to structural damage, and was thus a factor in the 1958 sinking of the ship. Since Bradley Transportation had never lost a ship since the founding of the company in 1912, the possibility of these events causing a disaster no doubt seemed remote. Under normal conditions, the Bradley was the fleet’s busiest freighter. But due to efforts to unionize deck officers, 1958’s shipping season was delayed. Although the officers eventually voted down union representation, ships did not begin to go out until the end of April. The steel industry suffered that year, and the Bradley was decommissioned in July. Docked for most of the season in Rogers City’s Port of Calcite, the Bradley was only put back into service in October. Just a few weeks later, the Bradley embarked on what was to be its last trip of the season. 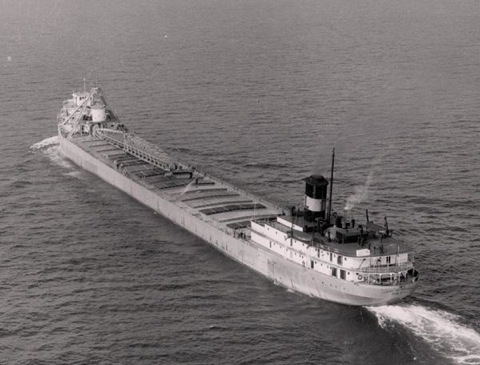 After delivering a cargo of crushed stone, the freighter left Gary, Indiana and headed to Manitowac, Wisconsin, where the vessel would be put into dry dock for the winter. The Bradley was but a few hours away from Manitowac when the company ordered them to the Port of Calcite for one more load of stone to deliver. On Monday, November 17, 1958, the steamer left Buffington, Indiana bound for Port of Calcite harbor in Rogers City, Michigan. When the crew in the pilothouse saw the stern sagging, their next radio message was “Mayday!” With the ship quickly breaking apart, Captain Bryan gave the order to abandon ship. Power on the boat had already gone out. As the crew scrambled for the life rafts, the Bradley literally broke in two. As the stern sank to the bottom of the lake, there was an explosion as water flooded the boilers. Two lifeboats were kept in the stern, and a single life raft in the vessel’s bow. Given the speed of the disaster, the crew had difficulty launching the lifeboats, which became tangled in cables. The lone life raft flew clear of the sinking ship; four crewmembers swam through storm-tossed waves to reach it. Four miles away, the German cargo ship M/V Christian Sartori viewed the sinking of the Bradley. When they saw a burst of flames through their binoculars, the crew assumed the Bradley sank as a result of an explosion. The Sartori quickly headed to the Bradley, but it took them over ninety minutes to travel a distance of four miles. They were eventually forced to take shelter from the heavy wind and waves at Washington Island. Sixty miles away, the U.S. Coast Guard Cutter Sundew set out from Charlevoix in response to the mayday message. Due to the severe storm, the cutter didn’t even reach the area of the disaster until 10:40pm, five hours after the Bradley went down. Once there, rough seas prevented the Sundew from continuing their search. A second Coast Guard Cutter Hollyhock arrived at 1:30am from Sturgeon, Wisconsin. Such was the brute force of the storm on Lake Michigan that the captain of the Hollyhock described their seven-hour trip from Sturgeon as “a visit to hell”. At 8:37am on November 19, the cutter came alongside the life raft that held surviving crewmembers First Mate Elmer Fleming and Watchman Frank Mays. The men were encrusted with ice and immobilized from the extreme cold. Swaddled in blankets, Fleming and Mays were brought aboard the cutter and carefully fed beef broth every thirty minutes. But they refused to leave the area while the search for their friends was going on. Four crewmen had initially clambered onto the life raft. Twenty-one year old Gary Strzelecki was still alive when taken aboard the cutter, but died soon after. The fourth crewman on the raft, Dennis Meredith, had already perished. The twenty-five year old Meredith was barefoot when he got onto the raft, and clothed only in a sweatshirt and pants. Exposed for hours on the seas during such a terrible November storm, his odds of surviving were slim from the outset. By noon, the Hollyhock had begun to recover bodies. The cutter arrived in Charlevoix with survivors Fleming, Mays, and eight bodies. Later that night, the Hollyhock brought nine more bodies. Since the Coast Guard cutters were expected to bring any survivors to Charlevoix first, friends and family members gathered there to keep vigil. They waited on the beach all night, directing their car headlights at the lake. With the return of so many bodies and only two survivors, the town seemed shocked into silence. In the days ahead, the search for survivors continued on the sea, air and ground, but the remaining fifteen crewmembers of the Bradley were never found. The search for the wreck itself had to wait until the ice thawed in the spring of 1959. The U.S. Corps of Army Engineers found the remains of the Bradley via sonar. The wreck lay approx. 360 feet below the surface of Lake Michigan south of Gull Island, and ¼ mile northwest of Boulder Reef. But the sonar readings did not answer the question of why the Bradley went down, nor did it confirm the surviving crewmembers’ statements that they had seen the ship break in two. Controversy ensued over the investigation. The Coast Guard claimed that the Bradley sank from what is known as ‘hogging’, a term which denotes the drooping of a ship’s bow and stern. Since ‘hogging’ causes stress to the hull, the assumption was that it contributed to the loss of the Bradley. Other theories included the ship’s metal fatigue when assaulted with a Great Lakes tidal wave, and the poor judgment of Captain Bryan, who headed out on the open lake in such a storm. These theories were disputed by Coast Guard Vice-Admiral A.C. Richmond who pointed out that the ship had twice run aground in 1958; both incidents went unreported. There was also evidence of hairline cracks. In addition, the cargo hold was to undergo maintenance later that winter. All of which led to his conclusion that the ship went down as a result of an “undetected structural weakness or defect.” This conclusion appears to be bolstered by Captain Bryan’s own beliefs expressed in a letter he wrote shortly before the Bradley’s last trip. He complained that the Bradley was not as structurally sound as it should be and that he didn’t think it should be out on the lake in severe weather. 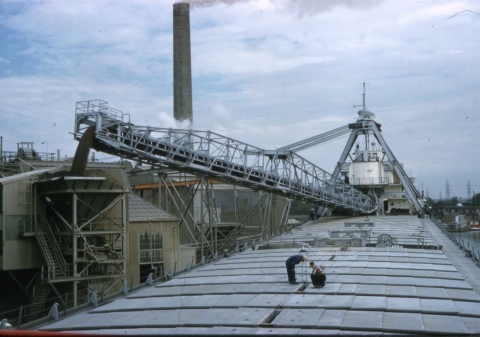 Indeed he wrote of his relief that his ship was scheduled for a cargo hold overhaul. Finally, like many ships built prior to 1948, the Bradley was constructed from notch-sensitive, brittle steel. This type of material was recognized as a factor leading to structural defects. The similarly constructed SS Daniel J. Morrell went down in 1966, the SS Edward Y. Townsend in 1968. The Coast Guard was advised to undertake structural overhauls on pre-1948 vessels. Following the loss of the Bradley, open life rafts were removed from Great Lakes ships and replaced with inflatables that came with protective canopies. Other safety changes associated with life vests, flares and rafts were also recommended. The condition of the vessel is of little comfort to the families and friends of the lost Bradley’s crew. Thirty-three men died that November day, and twenty-three of them hailed from Rogers City, Michigan. As a town of what was then less than 4000 residents, the sinking of the Bradley had a devastating effect. 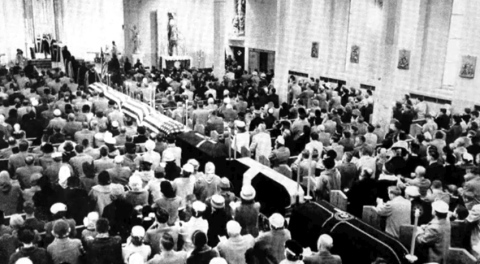 Every street found itself holding a funeral, and fifty-three children were orphaned. During the memorial service for the crew of the Bradley, Great Lakes ships dropped anchor at noon in tribute. A memorial dedicated to the 43 men who died on the Bradley and the Cedarville (a Rogers City vessel that went down in 1965) stands in Rogers City’s Lakeside Park. 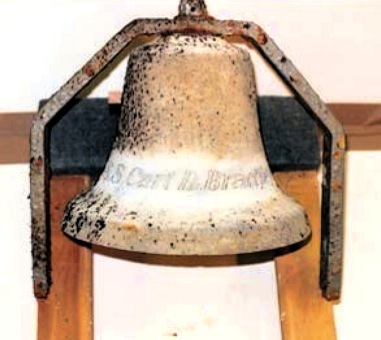 The Bradley’s bell was recovered from the wreck and returned to Rogers City for a ceremony held on the 49th anniversary of the tragedy. 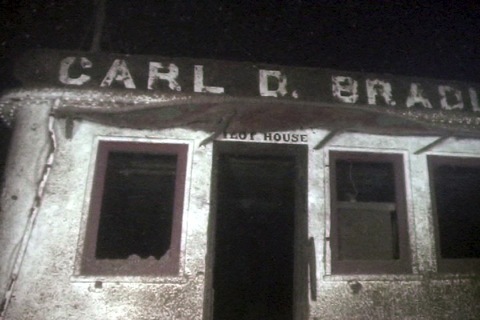 The Carl D. Bradley tragedy was later featured in Andrew Kantner’s 2006 book Black November, and in the 2008 award-winning documentary November Requiem. Like many ships before and after her, the fate of the Bradley showed that not even the ‘Queen of the Lakes’ could withstand the storms of November. Michael Schumacher, Wreck of the Carl D.